Saudi Arabia says GO ALL BLACKS! Ref does worry me, isnt he the same whistle blower that blew the Roo,s off the park Lions 3rd test? Stuck in Bangkok airport, anybody know a bar here that might show game? Tuning in from Edinburgh on my way to work, relying on the blog to keep me going! Thanks for the coverage, here climbing in Zermatt, Switzerland! About five minutes away from kick off now and the South African players are slowly making their way out onto the field in full tracksuits. ABs don't need tracksuits though. No sir. 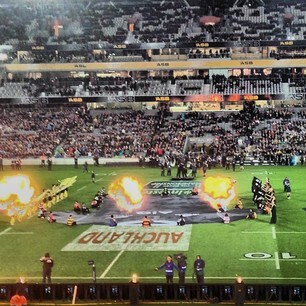 Kieran Read leads the side out onto the field, fireworks shoot up into the night and the crowd goes nuts. We are nearly set for song time. Anyone noticed how all teams come out in full tracksuits whilst the Men in Black come out ready for battle in their game attire? Anthem time. South Africa up first. Nick Afoa delivers a sultry African tune for the visitors. A gentle, passionate start which hits a nice crescendo around the halfway mark and jumps up a gear. Semi-inspiring, but dragged on a bit for me. 7/10 and beatable. Will Martin has the honours for New Zealand and gets the crowd pumping with a super opening Maori verse. When he transitions to English the crowd bellow it out. It's good, it's very good. I'm excited. 8.2/10, everyone bloody loved that. Boom. Another pre-match triumph for the All Blacks. We are yet to lose an anthem-off. Now it's haka time. Liam Messam will lead. Very impressed with your written commentary I won't even go and watch our 50 inch TV now prefer to read what's happening! Family stunned! Hah... love it! Even a commentary on the anthems! let's rock and roll boys, cant wait!!!! Messam does a great job. He is a powerful, intimidating man, and when he screams at you, it has to leave a psychological mark. Great haka, crowd are up for it. We're ready to go. no sky, no freeview.....go NZH!! We are underway. Carter kicks down to Engelbrecht and he clears for touch. Quick start to the game and the Boks have knocked it on. Kirchner was the culprit, good opportunity to see the scrum in action early doors. Big pressure and the ABs are penalised for the front row driving up. And there is a little bit of biffo. Boy, there's feeling in this one. Great push from the Boks. SA lineout now but they have lost it. Messam picks up the loose ball and spreads it to Aaron Smith who clears downfield. Le Roux had to take it into touch and the ABs have the lineout from 5m. Kieran Read brings it down and the ABs have bundled it over the line. TRY? Hold all bets, we are going upstairs. "Give me a reason why not" says referee Poite. Read scores the opening try of the test. The replays were inconclusive, but because the ref asked if there was any reason NOT to give it, the try was awarded. Carter swings his first kick straight through the posts. ABs lead 7-0 after five minutes. Both sides using a lot of boot early in the slippery conditions. But there is also a fierce front row battle and there have been a number of crunching hits. Boks kick this time and the ball trickles out inside the ABs 22. Pressure on the New Zealand lineout now. I like the sound of this ref. ABs are trying to play as quick as possible and don't want the Boks time to get set. But the ref pulls them back. Whitelock pulls in the lineout and the ball is recycled to Dan Carter who clears for touch.